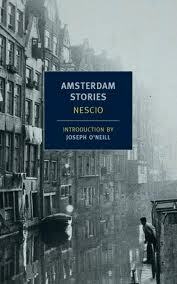 An aura of melancholy pervades Nescio’s Amsterdam Stories, the first English translation of the Dutch writer whose real name was Jan Hendrik Frederik Grönloh (1882-1961). Even the young boys in his stories know they will not stay young forever and probably won’t amount to much when they grow up. He was promoted at the office and inherited a little money and gradually started buying his clothes and shoes from different stores. That was when he bought that white flannel suit. He took to smoking four-cent cigars instead of two-and-a-half-cent cigars, he had a box of them at home, and he wore nice shirts and stopped wearing those thick wool socks, washed his hands before and after each meal, and spent a few guilders every week in cafes, both alone and with his wife. He took pleasure in his tobacconist’s polite greeting and the respectful cordiality of the conductor on Line Two. He had started working harder at the office over the years, started to get better at it, and it even sometimes happened that he went back after dinner and worked late though his boss never asked him to. His concierge held him in higher and higher esteem, and considered him a very educated man…. And twenty-eight years farther on down the road to the grave he saw his father’s gray head. He had always done well too and had not accomplished anything special either. He saw himself with exactly the same head having trudged along for another twenty-eight years and he felt like he was his own father. And twenty-three years behind him trudged his daughter, still just a little girl. Bobi wouldn’t get anywhere in the next twenty-three years either and yet she would walk the same road he was walking, the same and yet different. It was an absolutely meaningless procession, the little poet thought. One of the things I find so wonderful about this passage, which is typical for Nescio – and “Little Poet”, in particular – is the way in which Nescio uses brief flashes of free indirect narration to undercut the message of his own narrator’s tale. He presents the life summary quoted above in the more or less objective voice of the narrator, and, from the outside, the little poet’s life story is a bit of a rags-to-riches success story of a poor boy becoming a responsible citizen. Except that Nescio keeps adding those little throw-away hints that seem to pop directly from the mind of the little poet himself. “That was when he bought that white flannel suit.” “He took to smoking four-cent cigars … he had a box of them at home.” And: “those thick wool socks.” These are the kind of little self-accusatory asides that one says to one’s self when taking stock. They turn the apparent success story into one that represents utter failure. Not all of Nescio’s stories were as engaging as “Little Poet,” but when his writing is at its best he creates narrative voices of the most subtle and intelligent kind. Nescio. Amsterdam Stories. NYRB, 2012. Translated from the Dutch by Damion Searls, with an introduction by Joseph O’Neill.